Welcome to the Chicago Portage, the birthplace of Chicago. 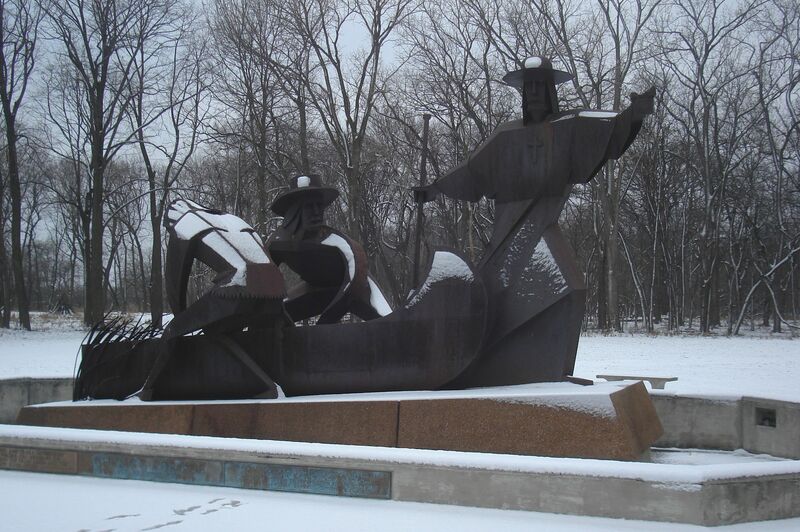 This National Historic Site commemorates the place where 17th century French explorers Louis Jolliet and Father Jacques Marquette were shown an ancient portage connecting the Great Lakes Basin and the Mississippi Valley watersheds. Connecting these two great water trails of the past meant easy access across the continent, from the Atlantic to the Gulf of Mexico. This strategic location soon became the hub of economic activity in the Midwest and to this day Chicago is a major center of the global economy. This website functions as a repository for the "Swamp to City" curricula, the "Portal to the Portage" narratives, the "Chicago Portage Ledger" collection and other articles, documents, images and other media relating to the Chicago Portage National Historic Site and the birth stories of Chicago. This website is also the on-line home of "Friends of the Chicago Portage". Friends of the Chicago Portage promotes the historic interpretation, ecological restoration and the appropriate development of the Chicago Portage National Historic Site through volunteer advocacy, public events and other projects that raise public awareness of its history and significance. The "Portal to the Portage" section and the digitized collection of the "Chicago Portage Ledger" were created with generous funding by Phillip Dowd. The collections on this site are hosted by the Carnegie Mellon University Libraries.